Under My Skin Tattoo Removal in Springfield, MO uses a Quanta laser to perform our tattoo removal services. Under My Skin Tattoo Removal uses a Quanta laser to perform tattoo removal. It is one of the Highest Quality Lasers available for this process. The goal of any tattoo removal laser is to SHATTER ANY COLOR OF INK WHILE LEAVING THE SKIN UNDAMAGED. 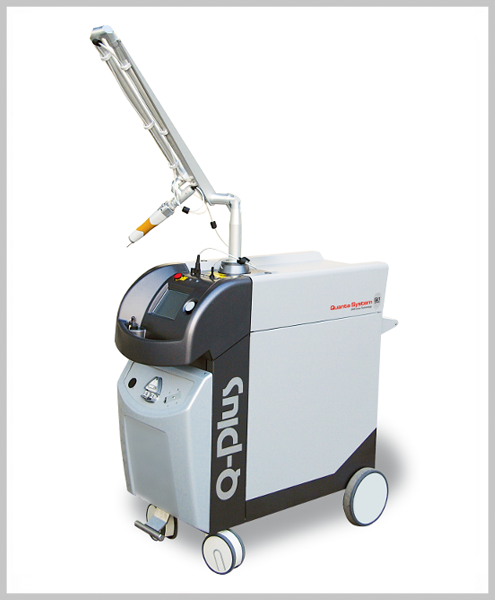 At Under My Skin Tattoo Removal we use a Q-PLUS C, Q-switched Quanta laser, one of the very best at achieving this goal; not only because the laser energy is delivered in extremely short pulses (six nanoseconds) using a square target area (causing thermal interactions with skin tissue to be reduced to a minimum), but because our laser has three true wavelengths, enabling us to remove All Colors. As a client of Under My Skin Tattoo Removal, you may breathe easy, knowing a Q-PLUS C Quanta laser will be used. Find out what information to bring to your free consultation.